There is no harsher environment in a home than the bathroom – they must be designed and built to withstand extremes of temperature (humidity) and tough daily use. At the same time, the bathroom is a space where people spend a lot of time every single day. So the choice of bathroom design becomes an important statement of a homeowner’s personality and style. As we all know, the bathroom has long served a very functional purpose. However, with home remodeling becoming increasingly popular, everything from the aesthetics of a home to its practical usage has seen enormous. Homeowners today not only want their bathrooms to be fitted with the latest spa amenities, separate toilet areas and built-in closets, but they also want their bathrooms to be just as attractive as the rest of the home. Today, bathroom remodeling design trends are moving toward styles that are calm, relaxing and comforting while still incorporating all of today’s modern conveniences. If you don’t have the space for a large soaking tub, frameless glass showers are increasing in popularity. 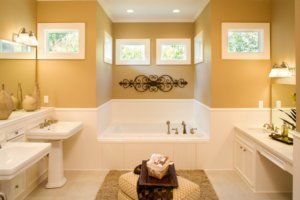 In keeping with the airy feel of many bathrooms, frameless designs can make the most of every square foot and can even make a bathroom seem larger. Natural lighting is a popular option today. For those whose bathroom remodel allows for dramatic structural changes, large windows are a common addition, especially skylights and sleek pane-free designs. (the natural light they let in is perfect for “getting ready” in the morning). For evening, many designers are integrating fixtures with soft light and even dimmer switches – just the right ingredients for a long soak in the bath. Heated floors can be a subdued form of luxury and comfort, and if you’ve ever stepped out of a hot shower onto freezing cold tile, you’ll likely agree. Another popular option, on-demand hot water, doubles as an eco-friendly addition and convenience. The key to today’s bathroom remodeling is balancing indulgences with essentials. It’s no secret that the no-frills bathrooms of yesterday have given way to new trends that place more focus on space and style, without compromising on comfort and functionality. Republic West Remodeling can create custom designs for your Scottsdale bathroom remodeling needs. Our team of experienced professionals will ensure that every detail, from bathtubs, showers and bathroom vanities to tiles and flooring are expertly installed for your continued enjoyment.